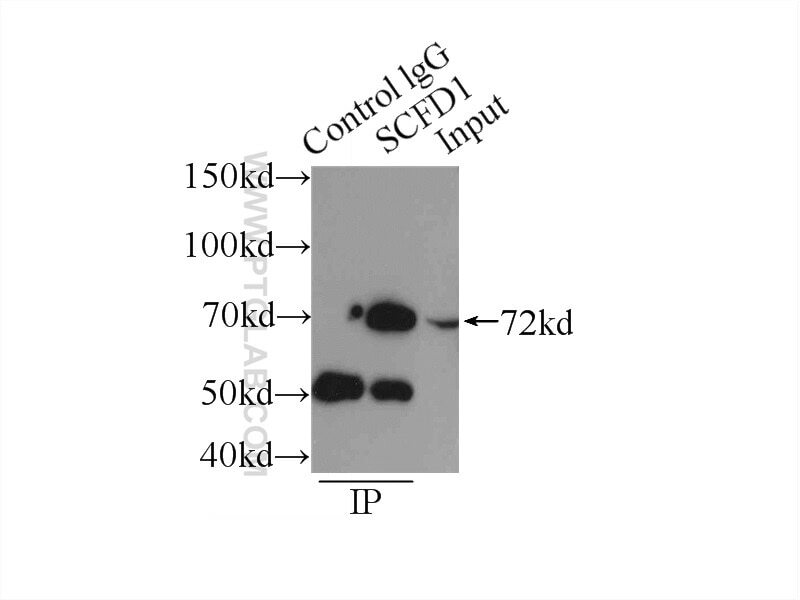 IP Result of anti-SCFD1 (IP:12569-1-AP, 3ug; Detection:12569-1-AP 1:500) with HeLa cells lysate 2150ug. 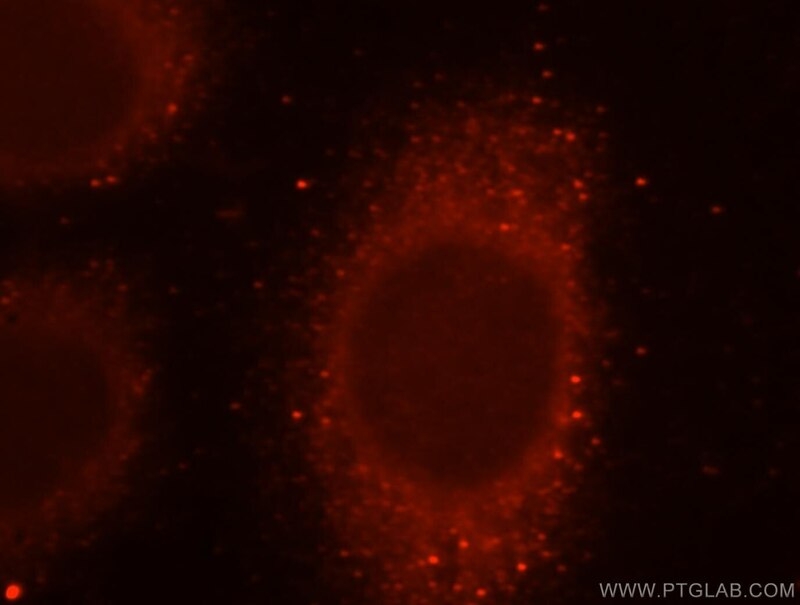 Immunofluorescent analysis of Hela cells, using SCFD1 antibody 12569-1-AP at 1:25 dilution and Rhodamine-labeled goat anti-rabbit IgG (red). 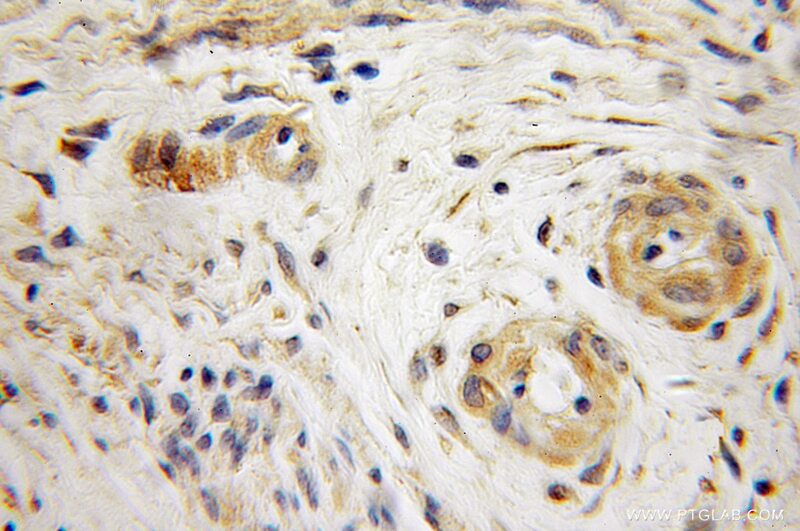 SCFD1, also named as C14orf163, KIAA0917, STXBP1L2, Sly1p and SLY1, belongs to the STXBP/unc-18/SEC1 family. It is a component of the syntaxin-5 SNARE complex which regulates the early secretory pathway of eukaryotic cells at the level of endoplasmic reticulum (ER) to Golgi transport. (PMID:21242315) SCFD1 plays a role in SNARE-pin assembly and Golgi-to-ER retrograde transport via its interaction with COG4. It is involved in vesicular transport between the endoplasmic reticulum and the Golgi. Autophagic substrate clearance requires activity of the syntaxin-5 SNARE complex. Silibinin attenuates Streptococcus suis serotype 2 virulence by targeting suilysin. Direct interaction between the COG complex and the SM protein, Sly1, is required for Golgi SNARE pairing.